This is a sturdy chest of drawers lovingly crafted from the strongest American White Oak. 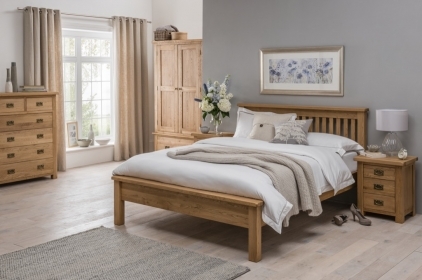 The 3+2 chest will add a hint of country charm to your bedroom. Hand built using time-honoured techniques, the chest has five spacious drawers, each with a stylish but simple curved metal handle. With dovetail jointed drawers and tongue and groove backs and bases, this piece features a brushed oil finish. The traditional construction makes the chest long-lasting.